Lagom är bäst, or the right amount is best a Swedish philosophy that fosters the concept of living a simpler and more balanced life. 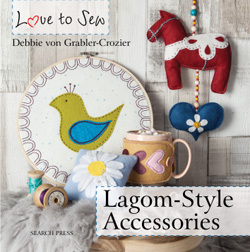 In this book, author and blogger Debbie von Grabler-Crozier shows you how to embrace the ethos of Lagom by teaching you how to sew 20 beautiful accessories for your home that combine Scandi style with simple and practical design. Inside, discover quietly stunning items such as a cushion, doorstop, a quilted throw, bunting and a wall hanging, as well as a bag and soft, felt Swedish house shoes; all of which are perfect for transforming your home into a Lagom-inspired retreat away from the bustle of everyday life. Each design is made using natural materials such as cotton, linen and wool felt, but can easily be created using spare material and scraps in the house. In addition, full-size templates are also provided on a fold-out sheet at the back of the book in a safe little pocket. With step-by-step instructions and gorgeous photographs accompanying every project, and essential sewing techniques clearly laid out at the beginning of Debbie's book, your path to a healthier, relaxing lifestyle has never been easier.